Utah ( or ) is a state in the western United States. It became the 45th state admitted to the U.S. on January 4, 1896. 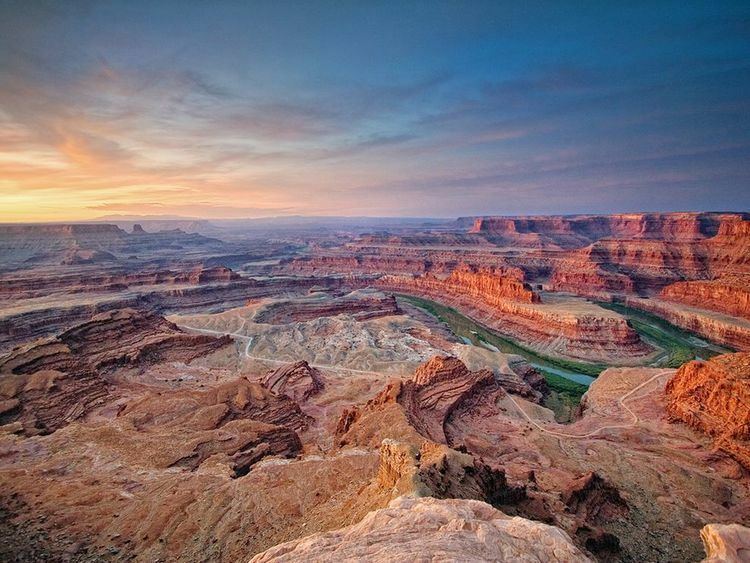 Utah is the 13th-largest by area, 31st-most-populous, and 10th-least-densely populated of the 50 United States. Utah has a population of more than 3 million (Census estimate for July 1, 2016), approximately 80% of whom live along the Wasatch Front, centering on the state capital Salt Lake City. Utah is bordered by Colorado to the east, Wyoming to the northeast, Idaho to the north, Arizona to the south, and Nevada to the west. It also touches a corner of New Mexico in the southeast. Some areas of the Wasatch Range in the path of the lake-effect receive up to 500 inches (1,270 cm) per year. The consistently deep powder snow led Utah's ski industry to adopt the slogan "the Greatest Snow on Earth" in the 1980s. In the winter, temperature inversions are a common phenomenon across Utah's low basins and valleys, leading to thick haze and fog that can sometimes last for weeks at a time, especially in the Uintah Basin. Although at other times of year its air quality is good, winter inversions give Salt Lake City some of the worst wintertime pollution in the country. Temperatures dropping below 0 °F (−18 °C) should be expected on occasion in most areas of the state most years, although some areas see it often (for example, the town of Randolph averages about 50 days per year with temperatures dropping that low). In July, average highs range from about 85 to 100 °F (29 to 38 °C). However, the low humidity and high elevation typically leads to large temperature variations, leading to cool nights most summer days. The record high temperature in Utah was 118 °F (48 °C), recorded south of St. George on July 4, 2007, and the record low was −69 °F (−56 °C), recorded at Peter Sinks in the Bear River Mountains of northern Utah on February 1, 1985. However, the record low for an inhabited location is −49 °F (−45 °C) at Woodruff on December 12, 1932. Utah ranks 47th in teenage pregnancy, lowest in percentage of births out of wedlock, lowest in number of abortions per capita, and lowest in percentage of teen pregnancies terminated in abortion. However, statistics relating to pregnancies and abortions may also be artificially low from teenagers going out of state for abortions because of parental notification requirements. Utah has the lowest child poverty rate in the country, despite its young demographics. According to the Gallup-Healthways Global Well-Being Index as of 2012, Utahns ranked fourth in overall well-being in the United States. A 2002 national prescription drug study determined that antidepressant drugs were "prescribed in Utah more often than in any other state, at a rate nearly twice the national average." The data shows that depression rates in Utah are no higher than the national average. A majority of the state's residents are members of The Church of Jesus Christ of Latter-day Saints (LDS Church). As of 2012, 62.2% of Utahns are counted as members of The Church of Jesus Christ of Latter-day Saints. Mormons currently make up between 34%–41% of the population within Salt Lake City. However, many of the other major population centers such as Provo, Logan and St. George tend to be predominantly Mormon as well as many suburban and rural areas. The religious body with the largest number of congregations is The Church of Jesus Christ of Latter-day Saints (with 4,815 congregations). Though the LDS Church officially maintains a policy of neutrality in regards to political parties, the church's doctrine has a strong regional influence on politics. Another doctrine effect can be seen in Utah's high birth rate (25 percent higher than the national average; the highest for a state in the U.S.). The Mormons in Utah tend to have conservative views when it comes to most political issues and the majority of voter-age Utahns are unaffiliated voters (60%) who vote overwhelmingly Republican. Mitt Romney received 72.8% of the Utahn votes in 2012, while John McCain polled 62.5% in the United States presidential election, 2008 and 70.9% for George W. Bush in 2004. In 2010 the Association of Religion Data Archives (ARDA) reported that the three largest denominational groups in Utah are The Church of Jesus Christ of Latter-day Saints with 1,910,504 adherents; the Catholic Church with 160,125 adherents, and the Southern Baptist Convention with 12,593 adherents. There is a growing Jewish presence in the state including Chabad and Rohr Jewish Learning Institute. According to the 2007 State New Economy Index, Utah is ranked the top state in the nation for Economic Dynamism, determined by "the degree to which state economies are knowledge-based, globalized, entrepreneurial, information technology-driven and innovation-based". In 2014, Utah was ranked number one in Forbes' list of "Best States For Business". A November 2010 article in Newsweek magazine highlighted Utah and particularly the Salt Lake City area's economic outlook, calling it "the new economic Zion", and examined how the area has been able to bring in high-paying jobs and attract high-tech corporations to the area during a recession. As of September 2014, the state's unemployment rate was 3.5%. In terms of "small business friendliness", in 2014 Utah emerged as number one, based on a study drawing upon data from over 12,000 small business owners. Rugby has been growing quickly in the state of Utah, growing from 17 teams in 2009 to 70 teams as of 2013, including with over 3,000 players, and more than 55 high school varsity teams. The growth has been inspired in part by the 2008 movie Forever Strong. Utah fields two of the most competitive teams in the nation in college rugby – BYU and Utah.